Southern Arizona Adaptive Sports believes in the power to adapt and achieve. We aim to transform lives through adaptive sports. We are a nonprofit, volunteer driven adaptive sports organization formed in 2017 to serve as a catalyst that connects and inspires people in ways to get involved, get active. Join us – Adapt, Believe, Achieve. 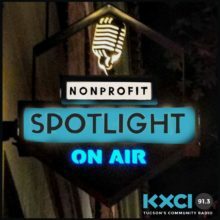 Mia Hansen, Board President of Southern Arizona Adaptive Sports joined Jennie G. to share more about the organization and how you can get involved.